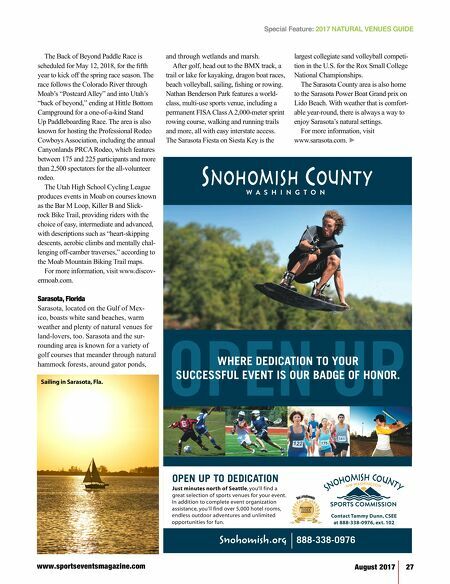 www.sportseventsmagazine.com August 2017 27 The Back of Beyond Paddle Race is scheduled for May 12, 2018, for the fifth year to kick off the spring race season. 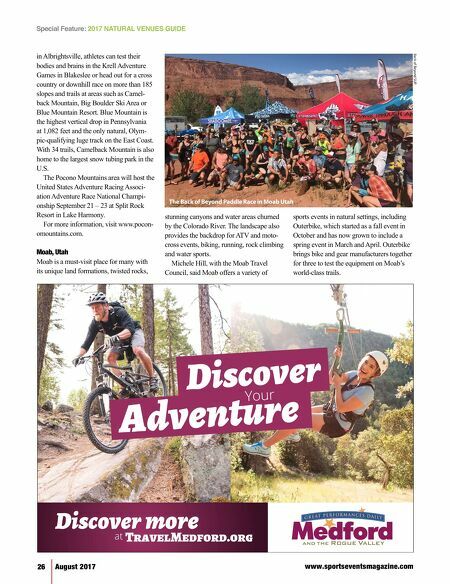 The race follows the Colorado River through Moab's "Postcard Alley" and into Utah's "back of beyond," ending at Hittle Bottom Campground for a one-of-a-kind Stand Up Paddleboarding Race. The area is also known for hosting the Professional Rodeo Cowboys Association, including the annual Canyonlands PRCA Rodeo, which features between 175 and 225 participants and more than 2,500 spectators for the all-volunteer rodeo. The Utah High School Cycling League produces events in Moab on courses known as the Bar M Loop, Killer B and Slick- rock Bike Trail, providing riders with the choice of easy, intermediate and advanced, with descriptions such as "heart-skipping descents, aerobic climbs and mentally chal- lenging off-camber traverses," according to the Moab Mountain Biking Trail maps. For more information, visit www.discov- ermoab.com. Sarasota, Florida Sarasota, located on the Gulf of Mex- ico, boasts white sand beaches, warm weather and plenty of natural venues for land-lovers, too. Sarasota and the sur- rounding area is known for a variety of golf courses that meander through natural hammock forests, around gator ponds, and through wetlands and marsh. After golf, head out to the BMX track, a trail or lake for kayaking, dragon boat races, beach volleyball, sailing, fishing or rowing. Nathan Benderson Park features a world- class, multi-use sports venue, including a permanent FISA Class A 2,000-meter sprint rowing course, walking and running trails and more, all with easy interstate access. The Sarasota Fiesta on Siesta Key is the largest collegiate sand volleyball competi- tion in the U.S. for the Rox Small College National Championships. The Sarasota County area is also home to the Sarasota Power Boat Grand prix on Lido Beach. With weather that is comfort- able year-round, there is always a way to enjoy Sarasota's natural settings. For more information, visit www.sarasota.com. ► Special Feature: 2017 NATURAL VENUES GUIDE WHERE DEDICATION TO YOUR SUCCESSFUL EVENT IS OUR BADGE OF HONOR. OPEN UP TO DEDICATION Just minutes north of Seattle, you'll find a great selection of sports venues for your event. In addition to complete event organization assistance, you'll find over 5,000 hotel rooms, endless outdoor adventures and unlimited opportunities for fun. Contact Tammy Dunn, CSEE at 888-338-0976, ext. 102 Sailing in Sarasota, Fla.